NEW MILFORD — Hard to believe, but it’s been nearly 14 years since New Milford High School senior football player Joe South was killed in a car accident on Route 7, those 14 years having flown by seemingly in the blink of an eye. No matter how much time may pass, however, South won’t be forgotten, especially by the Green Wave football family, which lost one of its own, far too soon, on that tragic night in November of 2004. Head coach Chuck Lynch still gets choked up when he talks about South, a 6-foot-2, 230-pound center and defensive tackle who wore No. 79. 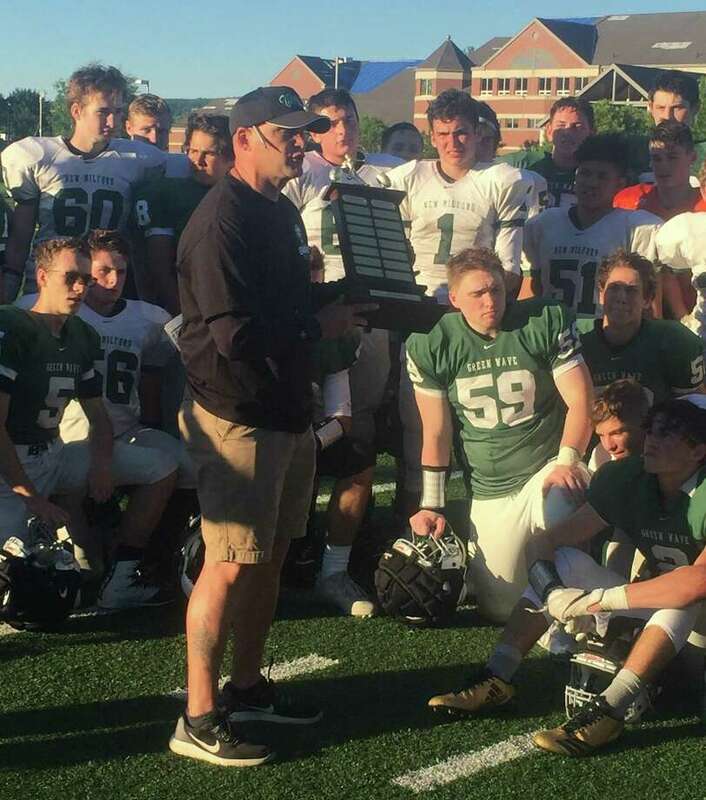 “He was just a great kid,” Lynch said at the conclusion of the Joe South Memorial Green and White Spring Football Game, which has become an annual tradition at New Milford High in the years since South died. South’s parents were on hand to help congratulate this year’s winner, the White Team, which scored a 21-13 victory. Lynch was hired in March as the Green Wave’s head coach, which, of course, was a position he held for 10 seasons from 2003-2012. He posted a record of 28-73 during his first stint at New Milford High, then served as an assistant coach at Western Connecticut State University on coach Joe Loth’s staff. When the New Milford job opened up again, he couldn’t resist. Quarterback J.T. Lawson completed three touchdown passes — two to Hunter Skelly and one to Matt Fish — to lead the White Team. For the Green Team, Nate Lawson threw two touchdown strikes to Johnny Fitzmaurice. “We have a new offense, a new defense and a lot of young players, but this year, we’re just going to have to work together like we did today on both sides of the ball,” Skelly said. Lynch liked what he saw. A defensive stand in the final seconds by the White Team — with its back against its own goal line — preserved the win. A sack by Devin Jasso on third down forced the Green Team into a fourth-and-long situation with the clock winding down. On the final play of the game, John Letizia caught a pass over the middle and tried to bulldoze his way into the end zone. He was stopped several yards short by several White Team tacklers led by Mike Define.